The WaterBase 900 Series is one of the most user-friendly water-based coating systems currently available. One of the improvements of the WaterBase 900 Series is that it is an entirely non-stirring system. Applying the WaterBase 900 Series is just as simple as applying any customary basic varnish. Consisting of just 52 mixing colours (including pearl, metallic and xirallic mixing colours), the WaterBase 900 Series has been kept simple deliberately. Combined with primers, clear coats and hardeners, this system yields excellent results at a modest cost. 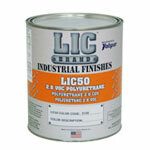 Product Description: LIC50 is a general purpose polyurethane enamel formulated to give outstanding gloss, depth, chemical resistance, and durability. This product is recommended for use where 2.8 VOC is required.